CPD Co-Chairs Frank Fahrenkopf and Mike McCurry stated, "We appreciate the many applications we received and are delighted with the sites we have selected. We look forward to working with these fine universities and their students and communities to bring these important civic events to the nation." An additional campus, Dominican University of California, will lead an initiative to use technology and social media to engage young voters in a discussion of major issues in the 2016 debates (#DUdebate16). The Commission on Presidential Debates (CPD) announced today that Wright State University has been selected to host the first debate in fall 2016 prior to the November general election. The debate will be held Sept. 26, 2016, at the Wright State University Nutter Center. The CPD is a nonprofit, nonpartisan corporation and has sponsored all general election presidential and vice presidential debates since 1988. To learn more about the CPD visit debates.org. Visit the Wright State University Debate 2016 website — wright.edu/event/debate — to learn more about the event. To learn more about Wright State, visit the Wright State University Newsroom and wright.edu. Farmville, Va.—The eyes of the nation will turn to Longwood on October 4, 2016 when the historic Virginia university hosts the lone vice-presidential debate of the general election. The Commission on Presidential Debates announced Longwood’s selection on Wednesday, along with three other sites that will host presidential debates. The vice-presidential debate will take place in Willett Hall on Longwood’s central campus. Additional information about Longwood and the debate is available at debate.longwood.edu. Recent colleges and universities to host vice-presidential debates include Centre College, Washington University in St. Louis, Case Western Reserve University and Georgia Tech. The 2012 vice-presidential debate at Centre College in Danville, Ky. attracted 51.4 million viewers nationally and countless more around the world. Typically, several thousand journalists travel to the debate site to cover the presidential and vice-presidential debates. In preparation to host this debate, Longwood received strong support from Virginia Gov. Terry McAuliffe, the entire Virginia Congressional delegation, and the town leadership of Farmville, one of America’s oldest two-college communities (Hampden-Sydney College is nearby). The non-partisan Commission on Presidential Debates has sponsored and produced every presidential and vice-presidential debate since 1988. 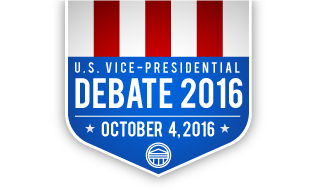 Information about the 2016 debates and site selection process can be found at www.debates.org. Founded in 1839, Longwood is among the nation’s hundred-oldest institutions of higher learning, and the third-oldest public institution in Virginia, behind William & Mary and the University of Virginia. With an enrollment of approximately 5,100 students, its distinctive mission is to prepare students for a life of citizen-leadership. Longwood’s campus stands at a remarkable historical crossroads, playing at one end a key role in the conclusion of the Civil War and at the other in the beginning of the Civil Rights movement. Gen. Ulysses S. Grant first proposed surrender terms to Confederate Gen. Robert E. Lee steps away from the north end of campus, while a historic student strike in 1951 over conditions at the all-black R.R. Moton High School at the south end of campus culminated in a lawsuit that became part of the historic Brown vs. Board of Education decision. As the eyes of the world turn to the 2016 U.S. presidential election, Washington University in St. Louis will play a prominent role in the national political conversation when it hosts a presidential debate on Sunday, Oct. 9, 2016. The schedule of four debates — three presidential and one vice presidential — was announced today by Frank J. Fahrenkopf Jr. and Michael D. McCurry, co-chairmen of the Commission on Presidential Debates (CPD). Candidates to meet in Las Vegas at UNLV’s Thomas & Mack Center for Final Debate in Fall 2016. UNLV and Las Vegas will take center stage as one of four host sites for a debate during the 2016 election season. The Commission on Presidential Debates announced that Las Vegas will host the presidential candidates on October 19, 2016. The debate will take place at the Thomas & Mack Center on the UNLV Campus. Jessup and Las Vegas Convention and Visitors Authority (LVCVA) President/CEO Rossi Ralenkotter are co-chairs of the Las Vegas 2016 Presidential Debate Committee. The LVCVA partnered with UNLV and submitted an application in March of 2015 to host a debate. In April, the Commission on Presidential Debates announced that Las Vegas was one of 16 sites under consideration. During the summer, the LVCVA and UNLV hosted commission staff for an on-site survey of the proposed debate venue and campus. Las Vegas has previously hosted primary debates, presidential speeches, and been long considered for political conventions by both parties. As an early caucus state, Nevada has played a key role in the election process already this year, and hosting a presidential debate will continue to increase the global visibility of both Las Vegas and the state. The debate attracts nearly 3,500 media representatives from around the world and can generate at least $50 million in publicity for Las Vegas and UNLV, according to data from 2012 presidential debate sites. Joining Ralenkotter and Jessup on the Las Vegas 2016 Presidential Debate Committee are Charles Bowling, President & Chief Operating Officer, Mandalay Bay, MGM Resorts International; Randy Garcia, CEO and Chief Investment Officer, Investment Counsel Company of Nevada; Sheriff Joe Lombardo, Las Vegas Metropolitan Police Department; George Markantonis, President & Chief Operating Officer, The Venetian, The Palazzo, and Sands Expo & Convention Center; Kristin McMillan, President & CEO, Las Vegas Metro Chamber of Commerce; Shaundell Newsome, Founder, Sumnu Marketing; Kevin Page, Board of Regents, Nevada System of Higher Education; Sig Rogich, President, The Rogich Communications Group; Rob Roy, Founder & CEO, Switch; Keith Smith, President & CEO, Boyd Gaming; Donald D. Snyder, Presidential Advisor for Strategic Initiatives, UNLV; Virginia Valentine, President, Nevada Resort Association; Billy Vassiliadis, CEO & Principal, R&R Partners; Rosemary Vassiliadis, Clark County Director of Aviation, McCarran International Airport; Radha Chanderraj, Principal, Chanderraj Law Offices; and Maurice Wooden, President, Wynn Las Vegas and Encore.